Whilst I sit on the side of the road waiting for my celebrity client to arrive home for her appointment (story of my life!) I’ve decided to write a blog on my personal facial products of the moment. First up is Time Bomb ‘Take Off Time’ cleanse and buff, I use this each morning (and some evenings or sometimes I use a cleansing oil or Micellar water). This product has a very satisfying consistency as it has a soft creamy base from the shea butter blended with tiny professional grade crystals that work to buff the skin as well as cleanse, hydrate and smooth at the same time! It carries a delicate scent of lavender (my fav!) and I love this product as a wake-up call in the shower first thing. Next up is The Ordinary, this brand blows my brains… I have no idea how they can sell such great products at the price they do!! However, they do, and we are all very grateful for this. I have worked my way through the brand and I can quite honestly say I love them ALL! This Glycolic Toner (that I waited 5 weeks to arrive) is a game changer, I am a big fan of acids on my skin anyway as I love the tight glowing effect it gives my face. I sweep this toner around my face, neck and over my chest once a day using a soaked cotton pad then leave it. Ideally, I use it at night before bed unless I am using some other brilliant products that doesn’t require me to use anything before. The results speak for itself, I found immediate results from fresh glowy skin to tighter and certainly brighter surface after a week. Hyaluronic Acid from Art Naturals, this is a company I stumbled across on social media. 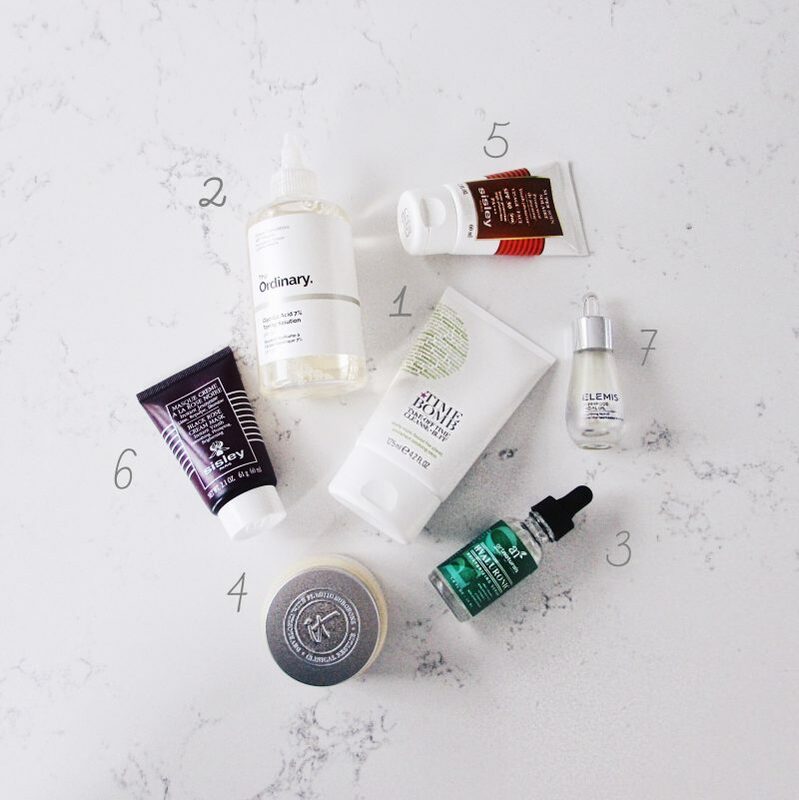 They are an American company who specialise in Aromatherapy skin care and oils (LOVE LOVE LOVE oils) so I tried out a few of their products including Art Naturals Hyaluronic Acid. A lot of people struggle with the understanding of why we should be using such a product, and I completely understand as Hyaluronic doesn’t necessarily show any immediate results. This is a natural ingredient found within our skins used to hold up to 1000 times it’s own weight in water, hence the thicker consistency. Using a product such as this helps to replace the lost Hyaluronic acid within our skin, and work from the inside out enabling our skin to hold water (hydration) working towards prevention of water loss. IT Cosmetics Confidence in a Cream, a new range developed alongside plastic surgeons from the US that has hit our U.K. Market with a storm. It is a super hydrating & anti-ageing day & night cream (it’s not ideal to use the same product for day and night) with a smooth creamy texture found to hydrate and plump the skin with hyaluronic acid & collagen fibers, niacin which is a strong vitamin B3 known to repair and strengthen skin cells, along with many more key ingredients to transform your skin. Great for all skin types including sensitive skins, doesn’t make your eyes sting so that’s also a bonus! Sisley Super Soin Solaire SPF 30 – As we know and keep getting told that sunscreen is an essential to keep our skin not only safe but to protect our skin from sun damage, not only can UV ray abuse cause the activation of skin cancer, but it will speed up the ageing process also known as Extrinsic ageing caused by our own carelessness, enhance pigmentation, age spots, wrinkles the list goes on! So, the answer to these woes is to wear SPF 30 or 50 daily without fail even in the winter months (UV still comes through) I like to try and test all sorts of sunscreen as I know most of my clients struggle to choose the right one for them without upsetting the balance of their skin. Some can make your eyes water, and some can cause bumps under the skin due to the oil within your SPF being too heavy. I particularly love this Sisley SPF as it doesn’t have that typical sun protection smell, it’s almost like a fresh flower scent, its light but also nourishing at the same time. Tried and tested and liked. Sisley Black Rose Cream Mask, is officially a legend in its own right. Ask anyone within the make up or beauty industry and they will have a pot laying around somewhere! The reason it’s so popular is because it’s divine luxurious scent of the freshest Roses you could get is so stunning you want to eat it. Along with it’s super nourishing ingredients including black rose & padina pavonica (marine algae known to stimulate collagen) to give your skin that ‘instantly youthful and radiant glow’. This soft and creamy consistency absorbs instantly giving you a second skin like layer on the surface. I like to layer it on generously and sleep in this Mask to feed my skin overnight, and sometimes I even use it as a day cream if I’m feeling dehydrated or if I’m in and out of the sun. Elemis Superfood Oil, I’m slightly obsessed with using facial oils (that’s an understatement!) the incredible effects of using an oil on your skin are endless. An oil works at a deeper level then any cream or moisturiser so it’s really an essential for all skin types including oily skins! (The old grey area around “I shouldn’t use any oils because I have oily skin”) to balance out the oil production within your skin you must use an oil from the outside to balance your ph and allow your skins sebum production to lessen. I love (as you can see it’s nearly empty!) to massage this oil into my skin before bed. The oils get to work immediately hydrating, softening, smoothing and plumping while the delicate scent of geranium sends me to sleep.